A video screencast can be edited like any other video in Articulate Storyline. Just right-click it and select Edit Video. When the built-in video editor opens, you can trim and crop to show only the portions you want; adjust the volume, brightness, and contrast to improve quality; and add a logo or watermark for branding. 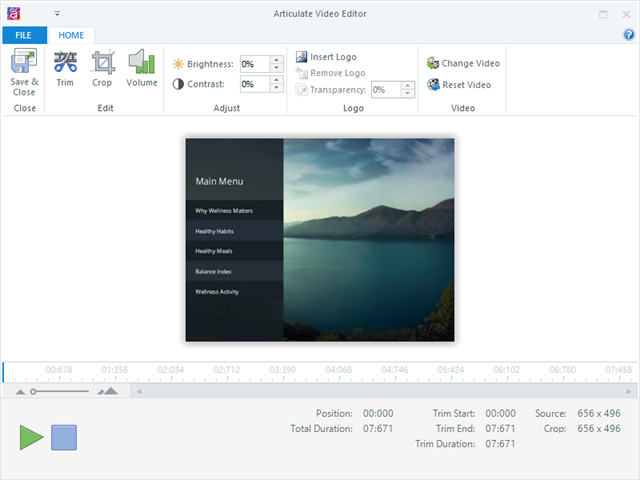 Learn more about the video editor here. Use the Video Tools—Options tab on the ribbon to adjust the video’s properties, including its relative volume, timing, controls, and more. See this user guide for details. 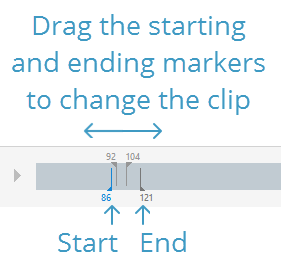 Step-by-step slides can be edited like other slides in Storyline. You can duplicate them, add completely new slides, and delete them when necessary. You also have complete control over the contents of each slide. You can modify the captions, hotspots, data-entry fields, mouse movements, and feedback layers that Storyline automatically created for you—or add your own content. Drag the starting and ending markers along the timeline until you've selected the clip you want to keep. If you want to undo the changes you made, click Reset Original Timing in the lower right corner. To fine tune other slides without closing and reopening the editor, use the drop-down at the top of the window or click Previous Slide/Next Slide.